Youths clash with riot police on Sunday during a massive demonstration near the main police station in Athens following the deadly police shooting of a teenager late on Dec. 6 in the Greek capital. Hundreds of youths angered by the fatal police shooting of a teenager rampaged through Greece's two largest cities for a second day Sunday in some of the worst rioting the country has seen in years. Gangs smashed stores, torched cars and erected burning barricades in the streets of Athens and Thessaloniki. Riot police clashed with groups of mostly self-styled anarchists throwing Molotov cocktails, rocks and bottles. Clouds of tear gas hung in the air, sending passers-by scurrying for cover. Rioting in several cities, including Hania in Crete and cities in northern Greece, began within hours of the death Saturday night of a 15-year-old shot by police in Exarchia. The downtown Athens district of bars, music clubs and restaurants is seen as the anarchists' home base. Soon stores, banks and cars were ablaze. 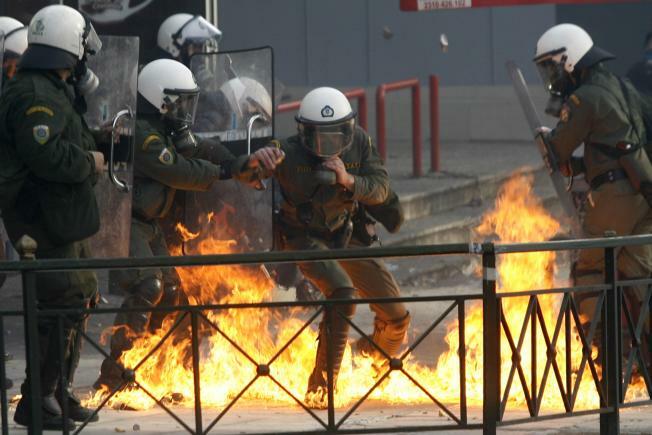 The rioting was some of the most severe Greece has seen in years. The last time a teenager was killed in a police shooting — during a demonstration in 1985 — it sparked weeks of rioting. In 1999, a visit to Greece by then U.S. President Bill Clinton sparked violent demonstrations in Athens that left stores smashed and burned. The two officers involved in Saturday's shooting have been arrested and charged, one with premeditated manslaughter and the illegal use of a weapon, and the other as an accomplice. They are to appear before a court Wednesday. They and the Exarchia precinct police chief have been suspended. Interior Minister Prokopis Pavlopoulos, whose offer to resign was rejected Sunday, has promised a thorough investigation. Police said the two officers involved claimed they were attacked by a group of youths and, when they confronted the youths, one fired three shots and the other threw a stun grenade. Violence broke out again Sunday afternoon in Athens and Thessaloniki during demonstrations to protest the shooting. "Cops, pigs, murderers," protesters chanted. Police said 24 policemen were injured in Athens in overnight riots that started Saturday, and another 13 on Sunday, while seven people were arrested and another 15 were detained. As night fell, groups of youths, some masked and others wearing motorcycle helmets, set trash cans alight and overturned cars to erect burning barricades on streets around the Athens Polytechnic — which, like all universities, is protected by law from police intrusion. Some could be seen walking on the roof of the Polytechnic, taunting police. Violence in the capital began to die down late Sunday, after several hours of running battles between police and rioters. In Thessaloniki, a large fire could be seen burning at the city's university. A blurry video shot by a bystander that purportedly shows the shooting Saturday has been aired on Greek television and posted on the Internet. Two sounds that could be gunshots can be heard, but the image is too blurry and distant to show the events clearly. Greece has seen frequent and sometimes violent demonstrations recently against the increasingly unpopular conservative government of Prime Minister Costas Karamanlis. The opposition Socialists are now consistently ahead in opinion polls. Dozens of stores in central Athens went up in flames or saw their storefronts smashed. At least two buildings were destroyed by fire, as was a Ford car dealership. Streets were littered with chunks of paving stones and rocks thrown at riot police, as well as shattered glass from storefronts and banks. "I understand the anger and the right to demonstrate it," Pavlopoulos said Sunday night. "What is inconceivable is the raw violence that undermines social peace and turns against the property of innocent people." Violence often breaks out between riot police and anarchists during demonstrations in Greece. Anarchist groups are also blamed for late-night firebombings of targets such as banks and diplomatic vehicles. The self-styled anarchist movement partly has its roots in the resistance to Greece's 1967-74 military dictatorship. The youths tend to espouse general anti-capitalist and antiestablishment principles, and have long-running animosity toward the police.